State Park and Forest Service rangers and local trail volunteers have been busy this winter assessing the impact of the Eagle Creek Fire. A few photos have been released from their trips into the still-closed burn zone, showing extensive damage to many of our favorite Gorge trails. The early glimpses are sobering and much work clearly will be needed to begin reopening trails to the public. More importantly, they gave us the first sense of just how long it will take for the Gorge to recover — and it’s going to take awhile. In early December, a far more comprehensive set of oblique aerial photos was captured by the State of Oregon as part of assessing the risks for landslides and flooding from the bare Gorge slopes. These amazing photos provide the first detailed look at how our most treasured places in the Gorge fared after the fire. This article features some of the most stunning of these startling images. My first reaction while first poring over the photos was shock and sadness. Like many of you, the Gorge was (and is) my second home, and it’s still hard to accept that the magnificent green Eden I grew up exploring has been destroyed. I’ll always long for the Gorge as it existing before the fire, even as I watch and learn from the miracle of forest recovery that will unfold in coming years. This is a paradox that we’ll all need to accept. But moving forward, we also need to refocus our love for the Gorge of memories on the urgent work that lies ahead, not only to restore what was lost, but also set a new direction for how this amazing place can be sustainably managed in perpetuity. We owe it to future generations who will only know the old Gorge from our photos to never allow a man-made catastrophe like the Eagle Creek Fire of 2017 be repeated. The lesson from the fire is not just that it was human-caused, but that the fire and its severity resulted from our own unwillingness to set limits on how we manage and use the Gorge. This is our challenge moving forward. This article is the first of a two-part series that features the best of the amazing new aerial photos. You can explore a large version of each photo in great detail by clicking on the “large view” link, which will open a 2000×1300 pixel version in a new window or tab. I’ve also enlarged some of the most fascinating highlights from these photos for the article. The first half of the tour covers the west portion of the Eagle Creek Burn, beginning at Shepperd’s Dell, and moving east to the Ainsworth State Park area. Like so many areas within the burn, it sometimes seems like the fire sought out our most treasured places. In this case, the fire wrapped around Shepperd’s Dell, proper, killing trees on top of the domed rock formation at the east (left) end known as Bishop’s Cap and on the cliffs directly above Shepperd’s Dell. This view also reveals the top tier of the four-step waterfall that cascades through the Dell. Though part if the second tier can be seen from the wayside, the tall upper tier is completely hidden by walls of basalt from below. The historic footpath that descends to the lower tier of waterfalls in Shepperd’s Dill is not significantly damaged, though it is vulnerable to falling rock and debris from the burned cliffs, above. Rangers have therefore closed this trail for safety reasons, for now. This close-up view (below) shows the picturesque stand of Oregon white oak growing on a prominent basalt outcrop next to Shepperd’s Dell bridge. These trees were scorched by the fire, but still hold their browned foliage, so it’s unclear if these will survive. We’ll know if they leaf out this spring. This part of Angels Rest burned in the 1991 Multnomah Falls Fire, and was still recovering last year when the Eagle Creek Fire swept through. A comparison of how these burns overlapped on Angels Rest is included in this earlier article on the fire. One interesting lesson from the fire is how living trees don’t really “burn” thanks to their water content, even if a tree is killed by the heat. Instead, the wood in killed trees usually survives fully intact, becoming bleached snags as burned park peels off in the year or two following the fire. Because the unburned wood is so sound, snags from fires as far back as the early 1900s are still standing in many places around the Cascades. Yet, many of the dried-out, bleached snags from the 1991 Gorge fire were burned to nothing but stumps of charcoal. This was true throughout the burn, where dead trees and old snags from previous fires were reduced to ashes in places while nearby living trees often survived the fire with only a blackened trunk. While the north side of Angels Rest burned hot enough to char the landscape down to blackened soil, the west side fire seems to have been less intense, with much of the understory appearing to survive, and many of the old snags from the 1991 burned black, but still standing along the lower edge of this close-up view (below). Moving east, the next photo shows the fire’s impact on Wahkeena Falls, among the more hallowed spots in the Gorge. While the burn affected slopes on both sides of the falls, much of the forest here survived the flames. A closer look shows Lemmon’s Point (the overlook east of the falls) to have burned, along with the steep cliffs to the west of the falls. Other photos in the set show the Wahkeena Trail above the falls to be heavily affected by the fire, with a lot of debris and fallen trees covering this iconic trail. News coverage has provided many views of Multnomah Falls since the fire began, but the new set of aerial views gives a much better look at the impact of the fire on the area. Like Wahkeena Falls, the fire here raged around the falls but left many of the big trees scorched, but alive. A closer look at this photo (below) shows burned trees along Multnomah Creek, just above the falls, and along the ridge to the east of the falls that marks the high point for hikers following the Larch Mountain Trail to the viewpoint at the top of the falls. The Forest Service reports that the viewing platform there was undamaged by the fire, though the spur trail to the viewpoint has been impacted by falling debris. This photo from just east of Multnomah Falls (below) provides a better look at the slopes where the Larch Mountain Trail scales the Gorge wall. Here, a mosaic burn has left many trees standing, which bodes well for this steep slope holding together as the recovery begins, but will also mean years of falling debris from killed trees and loose slopes for trail crews to clear. One of the challenges here will be keeping hikers on the trail, as switchback cutting has been a perennial problem in the Gorge, and especially along this very popular route. The fire provides an opportunity to better educate visitors about the damage that cutting trails can cause, but will require close coordination among state and federal land managers, and help from trail advocates. This photo (below) provides a view down Multnomah Creek canyon from (roughly) above the Wahkeena Trail junction, and gives a good sense of how the forests here fared. Though heavily burned, much of the burn pattern is still a mosaic pattern. If the living trees in this photo survive their first summer of drought stress after the fire, they should recover quickly and help the surrounding forest regenerate. This closer look at the photo (below) gives an excellent sense of how fire affects forests in a mosaic burn. While some trees were killed outright by the heat of the fire, others survived with some or all of their living canopy intact. When fires are hot enough to explode into tree canopies, fire fighters call this “crowning”, and it almost always means the tree will die. Less heat means that the cambium layer can survive under thick-barked older trees, and fires that don’t rage into the crowns of trees allow foliage to survive, as well. If the fire burns low to the ground and with less heat, trees like Douglas fir have evolved to have thick, fire-resistant bark that can survive this stress. Even in a relatively small area, as shown in the above photo, all of these fire behaviors can play out leaving a mosaic of living and killed trees. The mosaic effect, in turn, not only allows for a faster rebound of the burned forest and less erosion, but also provides a more diverse ecosystem that benefits the most plant and animal species. Before our intervention over the past century of fire suppression, mosaics from fire were the normal state of our forests. This is the crux of why prescribed burning — the practice of purposely setting forest fires in a controlled manner to reduce fuels and rejuvenate the understory — is the most ecologically sound path forward for the Gorge. Prescribed fires are usually set in late fall, when the approaching rainy guarantees a short burn and cooler weather encourages fires that are less hot and burn closer to the ground. For the next photo (below), you’ll need to adopt the perspective of a dive-bombing bird, as this is a near-vertical view of Weisendanger Falls (the splash pool is at the bottom of the photo) on Multnomah Creek (which flows up in this view). This is the first big waterfall above Multnomah Falls, and though a few trees around the falls were scorched, the forest canopy here mostly survived. A closer look at this photo (below) shows the Larch Mountain Trail switchbacks that climb above the creek at Weisendanger Falls. Like the switchbacks on lower parts of the trail, this area will require some diligence to keep hikers cutting the switchbacks in the absence of an understory that was burned off in the fire. Education will be key, as there are simply too many burned switchbacks throughout the Eagle Creek Burn to protect with barriers or other physical means, and these fragile slopes will only recover if they’re left undisturbed. To give a sense of what happened here, this is what Weisendanger Falls looked like from the first switchback along this section of trail a few years ago, before the fire. The good news is that many of the tall conifers here survived the fire, though the lush understory in this old view will take many years to recover. A closer look at the photo (below) shows the brink of Ecola Falls more clearly (on the left side of the image), as well as the burned-off cliffs at the top of the photo, above the falls. What shows up here as a brown slope is actually a basalt wall that was once covered in green moss and ferns — you can see a surviving sliver of moss clinging to a vertical section of the cliff in the upper left corner of the photo. While it won’t happen overnight, the “re-mossing” of burned cliffs and talus slopes in the Gorge will occur in the relative near term of the next decade or so. How do we know this? From recent rock falls and slides in the Gorge, where raw surfaces have been “re-greened” after just a few years of exposure to the cool, wet rainforest environment. The understory burned away here, too, though many of the large conifers around Ecola Falls survived. Trees killed by the Eagle Creek fire will eventually drop into Multnomah Creek and in the future, and for many decades to come, we will see log piles accumulate below the major waterfalls. Beyond aesthetics, in recent years stream ecologists have learned that logs and woody debris in streams are an essential ingredient to healthy fish habitat. So in this way, we’re simply returning to the way things have always been in the Gorge, and the coming wave of logs is only new to our eyes. In many areas, the fire seems to have skipped over talus slopes like this, hopefully allowing the unique, low elevation population of Pikas that live in these areas of the Columbia Gorge to survive the burn. We’ll know soon enough, as the Gorge Pikas are active year-round, and their distinctive “beep” is unmistakable for passing hikers. In many areas, these trees seem to have survived, though many were lost to the fire. We’ll know the full impact of the fire in the next year or two, after trees that survived the burn have faced their first summer drought and subsequent winter season. The following series of images are especially tough to look at. For many, Oneonta Creek is (or was) second only to Eagle Creek for its spectacular waterfalls, famous slot gorge and — until now — magnificent forests. All of this has changed. As the following photos show in jarring detail, the forests of the lower Oneonta Creek canyon were almost completely destroyed by the fire, with only a few scattered trees surviving. Worse, many of these surviving trees are still fire damaged and likely to die under the added stress of drought next summer. A closer look at Oneonta Gorge (below) shows the devastation more clearly. One of the obvious impacts of the fire is that the infamous logjam at the lower entrance to the gorge is about to get a LOT bigger, as burned logs begin to roll into Oneonta Creek by the hundreds over coming decades. While the logs will benefit the ecological health of the creek, the logjam in Oneonta Gorge could prove catastrophic to the historic highway bridges downstream, as described in this earlier article on the blog. The fire may finally spur some sort of intervention by ODOT and the Forest Service to remove the logjam. The aftermath of the fire also provides the Forest Service with an opportunity to finally close Oneonta Gorge to swarms of teenage waders who overwhelm this place each summer. It’s time give this precious place a much needed rest from the crush of people who have “discovered” it in recent years, and in the long-term, severely restrict access with an enforced permit system. The fire also burned away the wood lining of the recently restored Historic Highway tunnel at Oneonta Bluff, on the left in the above photo, and shown in the photo below. This is another opportunity for a reboot of this historic feature. ODOT should absolutely rebuild the historic wood lining, but as thousands of young people proved by thoughtlessly carving their names and messages into the soft cedar surface, the public can’t be trusted with uncontrolled access to this restored treasure. If it is rebuilt, the tunnel must be securely gated, and only opened on weekends when visitors can be monitored by agency staff or volunteer. This is one of many examples where we have a unique opportunity to set limits on how we use the Gorge, and ensure we pass it along to future generations in better shape than what we inherited. This close-up view (below) from the left side of the photo shows how the fire burned away a segment of the cliff face, while leaving ferns, moss and a few trees clinging to an untouched section of cliff, just feet away. The understory at the top of the cliff was completely burned, but a stand of Douglas fir survived to help begin the recovery here. The Horsetail Creek trail passes through this stand of trees on Oneonta Bluff. This photo of the entrance to Oneonta Gorge (below) shows the cliff walls inside the gorge green and intact — an encouraging sign that the rare plant and animal species that live here may have survived the burn. Sadly, the forest was completely killed in this idyllic spot. In this close-up view of the photo (below), Oneonta Bridge Falls, the small cascade above the bridge, can be seen with the first of what will be many more logs filling this stream in decades to come. And while the lower Oneonta footbridge seems to have survived the fire intact, the steep, terraced switchbacks climbing the canyon east of the bridge appear to be heavily impacted by erosion that followed the fire. Another surprising lesson from the fire is the important role of the ubiquitous Licorice fern and the moss carpets they inhabit in holding loose rock and talus slopes together in the Gorge. These tiny plants are the living glue that keep the Gorge slopes intact. Fortunately, these will also be among the first plants to return to burned areas. Waterfall explorers have long visited beautiful Middle Oneonta Falls and its deep cave by following a steep, sketchy boot path on the west side of the canyon. In recent years, a major landslide not only took out the Oneonta Trail, proper, but also this little-known boot path, completely blocking the descent to the middle falls. This photo of Oneonta canyon (below) shows what waterfall lovers have dreamed of for years: a clear route for a future trail along the east bank of the creek to Middle Oneonta Falls. While the fire has impacted the forest here for generations to come, it also brings an opportunity to enhance the trail network as part of the restoration with a once-in-a-century view of the landscape laid bare. The grove of Douglas fir on the left side of this image were 50-70 years old before the fire destroyed them, so while I won’t live to see this scene restored, many in today’s Millennial generation will. It’s difficult to confront the loss, but these images from before the fire will be important for younger generations as a visual reminder of what coming the Gorge restoration is working toward. The burn gives the Forest Service an opportunity to rethink and redesign the trails at this overlook, where heavy foot traffic was already causing serious erosion and loss of vegetation, even before the fire swept through last fall. While counter-intuitive at first glance, this is another important lesson from the Eagle Creek fire: part of the natural selection process in our forests is the ability for trees to grow fast, large and tall enough to survive periodic fires, thus surviving to generate the seedlings that will begin the recovery of the surrounding burn. A closer look (below) at familiar Horsetail Falls shows many of the big conifers around the falls surviving, even though the fire swept down to the edge of the Historic Columbia River Highway. The Horsetail Creek Trail can be seen climbing the slope to the left of the falls in this view, and appears to be somewhat impacted by falling trees and debris. Fans of the informal Rock of Ages trail will find rough going in the future along this informal route that climbs above Horsetail Falls. In this close-up view (below), the entire ridge appears to be burned over. Because the trail is not officially recognized or maintained, falling debris and erosion will take a toll on this route, even if hikers work to keep the unofficial route open. A close look at this photo (below) shows Archer Mountain on the Washington side of the Gorge. This view gives a good sense of just how massive the Eagle Creek fire really was, as embers from the fire were carried more than a mile across the Columbia River where they ignited a small fire on the slopes of Archer Mountain. Firefighters were briefly concerned with the possibility of the fire spreading broadly across the Washington side of the Gorge, but managed to contain the fire to a few acres on Archer Mountain. The fire was surprisingly agile here, burning ancient trees perched on remote ledges across the 3-mile long cliff face here (below). The vertical topography protected many old trees, too, where many isolated giants remained out of reach from the flames. The geology of this area is notoriously unstable, with frequent rock falls and mudflows. The loss of forests to fire here is expected to accelerate erosion for decades to come. One such mudflow spilled down these slopes in the 1990s, burying a farmhouse to the second story and spreading across Interstate-84, closing the freeway for days. This mudflow had since grown a dense stand of Cottonwood and Red Alder trees (below), obscuring the abandoned, buried farmhouse over the past quarter century. Surprisingly, the Eagle Creek Fire seemed to seek out this young stand of trees, burning it entirely, and finally destroying what was left of the old farmhouse, which can be seen as a rectangle of white ashes in the close-up view, above. Older conifer forests (on the right) bordering the mudflow survived the flames, as did irrigated fields where fence lines served as firebreaks. 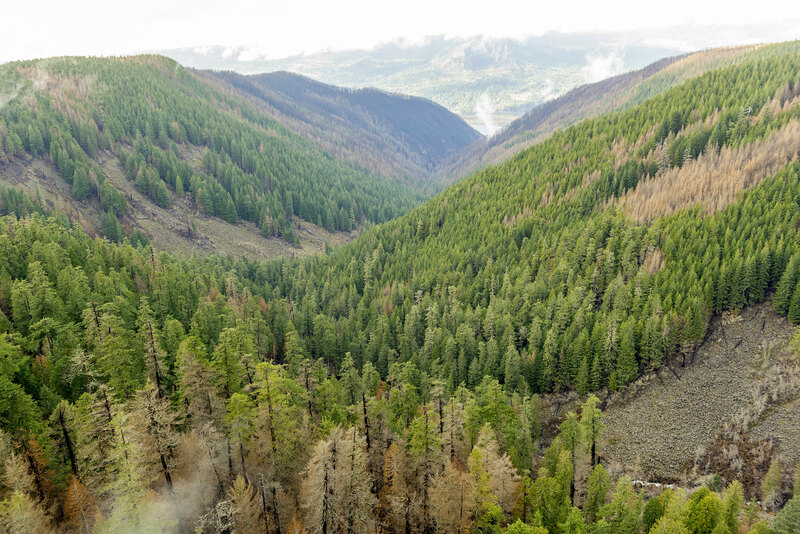 Scenes like this help us better understand how fires shape the evolution of our forests over time. These photos are hard to look at. For so many of us, the Gorge is a sacred place where we go to escape the stress of urban life and ground ourselves in the perfection and serenity of nature at its most sublime. Seeing the once lush, green landscape reduced to blackened tree skeletons and ashes is shocking, to say the least. But moving forward, every year will mark what is expected to be a rapid recovery. It also offers us a chance to be part of the recovery. If the 1991 Multnomah Falls Fire is our guide, we’ll see young trees established within a decade and new forests well on their way to maturity by the time today’s Millennials begin receiving their Social Security checks. That’s reassuring, as learning to understand our place in the natural landscape begins with accepting that we are just passing through ecosystems that existed long before us, and will thrive long after we are gone. Our role is to ensure that future generations inherit healthy, thriving ecosystems that are enhanced by our actions, not harmed by them. In the meantime, you can do something about the Gorge recovery right now! How? Sign up for a Trailkeepers of Oregon (TKO) trail project. TKO already has several events lined up beginning in February, and there will be many more events to coming for years to come. This is a great way to give back and be part of restoring our Gorge trails, and no experience is required — just an able body and passion for the Gorge! If you can dig in your garden or rake leaves, you can be a volunteer on a trail crew. You can also support TKO with a donation through their website. Next up in Part 2 of this article: McCord Creek, Moffett Creek, Tanner Creek, Eagle Creek and Shellrock Mountain. Author’s note about the photos: a friend of the blog pointed me to the amazing cache of photos featured in this article, and while you could probably acquire them from the State of Oregon, I would encourage you to let our public agency staff focus their time on the Gorge recovery, not chasing down photo requests. With this in mind, I’ve posting the very best of the photos here, and have included very large images for those looking to use or share them. These photos should be credited to “State of Oregon” where noted in this article, not this blog. They are in the public domain. For camera buffs, the century-old Bucher family dairy barn at the foot of St. Peters Dome in the Columbia River Gorge has been like an old friend. The huge, stately old structure could not have been more picturesque, with its bleached planks and rusty tin roof standing in dramatic contrast to the towering basalt walls of the Gorge. 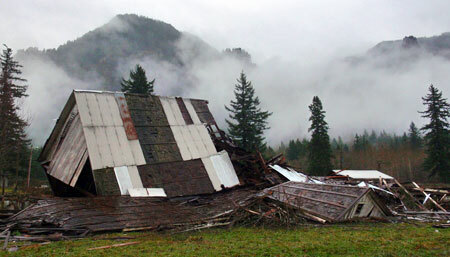 Thus, it was to the great dismay of many when the barn came down this fall, and now is in the process of being salvaged. 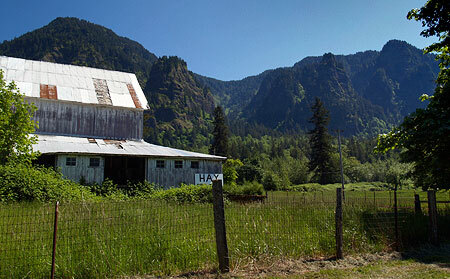 The Bucher barn was located in the old Dodson district, a fading rural village that experienced its heyday in the 1930s, when the original Columbia River Highway was the premier travel route through the Gorge. 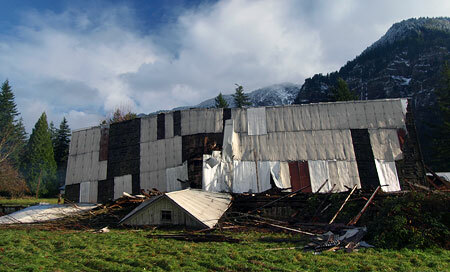 Until its recent collapse, the barn had survived to become the most prominent structure in the Dodson district in recent years, familiar to speeding traffic on I-84 (and plainly visible in the air photo, above). The Bucher barn was tucked at the base of the towering cliffs and spires of Ainsworth State Park, with Yeon Mountain, Katanai Rock, St. Peters Dome and Rock of Ages filling the skyline. Nesmith Point is also prominent, and is the loftiest cliff in the Columbia Gorge, rising nearly 4,000 feet directly above the river. In recent years, the U.S. Forest Service and Oregon State Parks have been actively acquiring private land in proximity to the Bucher barn as part of implementing the long-term vision for the Columbia River Gorge National Scenic Area. According to the National Integrated Land System (NILS), these acquisitions may cover the Bucher barn parcel, which could explain the barn coming down, though I have not been able to verify this connection. (Note: please see the postscript to this article for updated background on the ownership of the barn and decision to bring it down). 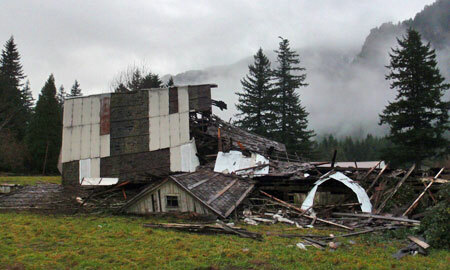 The current deconstruction of the Bucher barn was underway by mid-November of this year. The plank siding had been partially removed from the lower half of the structure by Thanksgiving, but the main building frame was still intact. By late November, however, the building had been toppled, tipping forward toward the frontage road with the roof framing intact. Whether the collapse was intentional or from a structural failure is unclear, though the ongoing salvage operation suggests that it was dropped intentionally. A series of early winter storms gripped the Gorge in late November and early December of this year, but the salvage work continues, and by mid-December, half the roof frame of the Bucher barn has been removed, along with most of the metal roofing. 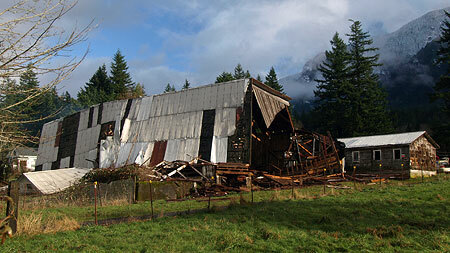 At the current rate of removal, the barn will likely be gone in a few weeks, taking a bit of Oregon history with it. Thankfully, it is one of the more photographed barns in the region, so will live on through images that captured its charm and unique setting. The sudden demise of the Bucher barn is a reminder that historic barns are fading away across the Oregon landscape, so hopefully others can be equally appreciated and documented while they are still standing. 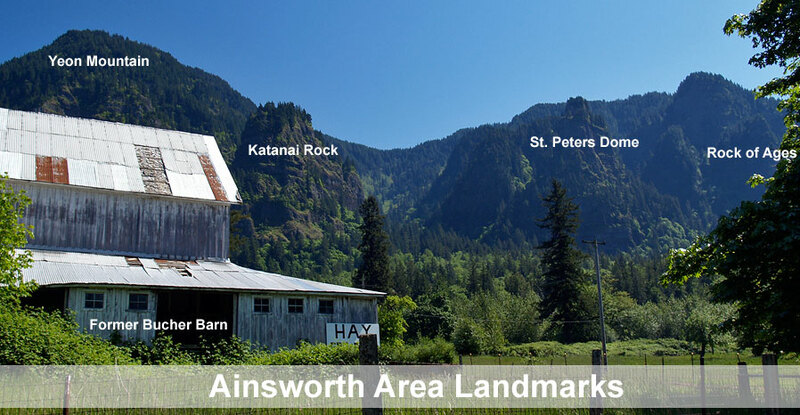 If you are interested in seeing this rapidly disappearing bit of history, take the Ainsworth exit on I-84, then follow signs to the eastbound Frontage Road and John B. Yeon State Park. The barn is located one-quarter mile from the interchange, just beyond the first house. Please respect the private property signs, and stay outside the fenced pasture. Though all but the Katanai name are official and found on USGS maps, interpreting the jumble of contours on the map as they related to real features on the ground turns out to be more difficult than I’d imagined. Thus, I’d appreciate any corrections to this schematic that local residents or area explorers have to offer. Finally, I’d like to thank Breanna Mohr and the Bucher family for not only providing historical background on the area, but also for keeping this fine old structure standing for so long. While it shall be missed by all of us, it was enjoyed for decades for its picturesque charm, and lives on in our memories, as well!